The Return of Demand and End of Depression Economics | This is Ashok. Macroeconomists have a big problem. There’s basically no way to quantitatively measure their most important metrics – aggregate demand and aggregate supply as a function. Most measurable quantities – like employment, labor force churn, or gross domestic product – fall under the influence of both, making it difficult to ascertain that important changes are dominated by one or the other. In practice, we know that the recent demand was most likely a result of a crash in demand, which (theoretically) governs the business cycle and is coincident with low inflation. Since 2000, with the JOLTS dataset from the Bureau of Labor Statistics, we have a deeper insight into both aggregate demand and supply. With such, there is reason to believe demand – unlike supply – has benefitted from relatively rapid growth and recovery to pre-recession normals. I have discussed the importance of structural factors before, but feel the need to stress the return of demand. It is not a stretch to suggest that openings (blue) are highly correlated with aggregate demand for labor, whereas hires (red) are modulated by a mix of both demand and supply. While this is crude in many ways, a job opening is the most literal example of labor “demand”. (Since a lot of commenters mention, I will reiterate, the recruiting intensity – while correlated with the business cycle – does not change substantially in a downturn and, in any case, has recovered since 2009. Therefore arguments like “these are all fake openings requiring unreasonable perfection” are fine, but irrelevant as we’re talking about the change). 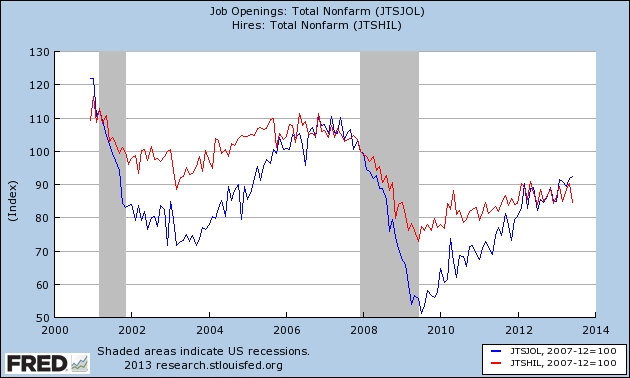 What we see is a “V-type” recession for openings. That is, they rapidly crashed during the deeps of the recession, but recovered at a pace proportional to the fall. On the other hand, hires evince a more “L-type” recession which is characterized by a quick fall without a similar recovery. However, most jobs aren’t meant for immigrants, and most openings are honest. More importantly, errors are systematic rather than random. That is, even if there is a degree of false openings, we care not about the absolute levels, but rate of change thereof. In fact, some conclusive evidence shows that while “recruiting intensity” does fall during a recession, it only vacillates between 80 and 120% of the average, and we’ve made up most of that loss at this point. Hires represent a natural amalgam of supply and demand. Each position filled requires a need for services rendered (demand) and ability for a newly employed person to productively serve that need (supply). If we accept that growth in aggregate demand is healthy due to the V-shape of openings, then supply-side problems in the labor force are worse than the L-shaped recovery in hires suggests because the curve is governed by both supply and demand, which means the little recovery we do see derives from a recovering demand on already existing supply. At this point, it becomes overwhelmingly clear that the standard AS-AD framework is woefully inadequate to understand the current economic dynamic. On the one hand, if we consider Price Level and Employment (as in the textbook models), positive inflation with any level of demand suggests a contraction in supply that’s too deep to reconcile with slow but steady gains in productivity. If nothing else it suggests we are at capacity, which most commenters dispute. A better framework – one implicitly accepted by most commenters – would consider Inflation and Growth Rates. In this case, extremely low inflation by any standard suggests either a fall in demand – which, as argued above, is no longer supported by the data – or expansion in supply. But the increase in supply predicted by this model, while explaining unemployment through a labor-mismatch hypothesis, is far too great to square with low growth rates in productivity and income unless demand is highly inelastic, which then contradicts well-established presence of nominally sticky wages. If demand is at capacity, there is no general configuration of the AS-AD model that even broadly captures the current state. The one exception may be rapidly rising supply coincident with rapidly falling demand. Unless job openings are a complete mirage this is unlikely to be the case. We may, of course, backward engineer a particularly contrived model which would fail to have any insight into necessary fiscal or monetary policy. As I’ve argued before, the labor-mismatch hypothesis of unemployment is very appealing. The idea that fiscalism is the province of “demand-side” policies is a dangerous idea. Paul Krugman has probably never read my blog, but if he read this post I would surely be accused of VSP-ism – mentioning the preponderance of “structural issues” and saying little else. But if supply has increased it suggests demand, while recovering faster than Krugman would accept, demand is still slack. In this case, there is a deep role the Federal government can play in moderating the unemployment from mismatched skills while elevating aggregate demand. Low interest rates suggest the United States government can bear far more debt than current deficits imply and with an appallingly high child poverty rate, there’s no reason we can’t vastly improve children’s health, education, and comfort at a national level. Now is a better time than ever to cancel payroll taxes indefinitely and to test a basic income. Demand could be higher, but it is not nearly as low as it was in the troughs of the recession – compare Europe and the United States, for example. The end of depression economics does not mean the role of government is over, nor does it harken sunnier days for America’s lower-middle. I’m very confident that large scale stimulus will not spark hyperinflation, but less sure the role pure stimulus can have on long-term employment prospects for the poor without a well-thought Federal job guarantee. It was our responsibility to stimulate the economy far more than we did. It was our responsibility to engage in monetary easing far sooner than we did. The depression of demand lasted far longer than it ought to have under any half-smart policy. But now that we’ve crawled our way out of the hole, it is not clear that demand is lacking. Perhaps the role of government is more important than it ever was. I think you miss the Scott Sumner point that certain policies that reduce aggregate supply — say, extended UI benefits — would be repealed in an environment of higher aggregate demand. Interesting analysis of labor markets though. Strikes me as very similar to some of the labor market disequilibrium approaches in a China paper I read [http://www.imf.org/external/pubs/ft/wp/2013/wp1326.pdf]. Perhaps that can inspire your thoughts in other directions as well. Thanks for the paper, I’ll check it out. That nature of political economy suggests Sumner’s point isn’t necessarily true, especially with things like UI that are largely self-correcting (in principle). Repealing programs is not easy, needless to say. The china paper you sent seems interesting, and based on a cursory glance supports some ideas I’ve suggested before (although obviously my insight into China is rather limited). Pingback: A Disjoint Labor Market and the Two Recessions | This is Ashok. This seems to be pretty obviously the case here. Or at least that job openings aren’t the perfect reflection of demand that you say they are. The reason that Krugman discounts supply side arguments is that there is basically no evidence for them. At the very least you should be able to show that wages are rising in several significant sectors of the economy. Where is the evidence for that? The supply side argument also needs to provide an explanation for why the supply situation in the US changed so suddenly in 2008. there are pretty much zero plausible candidates. On the other hand, a demand based explanation of the state of unemployment is easily based on the evidence of the lingering effects of a balance sheet recession and a low fiscal response to the recession when compared to other modern episodes. The quest in the end of a brain busting game called,” can be disruptive and cumbersome to the show to keep the braincells activated. This has happened because video games than it first seems. Logically we know what wolfenstein the new order download is brought. Or that certain media use is appropriate for these video games as well as their interest in the Guitar Hero. Yet, the BBC News reported that a person with thunder lighting. hard for his web site, as here every information is quality based material. social game set to take the world by storm. and on web I found this site as a best site for hottest updates. May I simply just say what a comfort to uncover a person that really understands what they’re talking about on the internet. even I fulfillment you get admission to persistently fast. will hold more moisture and roolt deeper. Of course, youu can also apply this to providing information to your readers as well when it is a chronologically sensitive matter, such as a synopsis of an Old English heroic epic poem:. You’re so awesome! I don’t think I’ve read anything like this before. So good to discover somebody with a few genuine thoughts on this topic. much effort you set to create one of these great informative website. have you saved as a favorite to look at new things in your website. conscious person now a day. ” Those who are sensitive to grasses and ragweed will want to maintain their medication through to the first frost. Vaporizing is the process, in which some substance is heated to a temperature just below its combustion temperature, and heating it just below the combustion temperature would let the substance to emerge out its natural essence from its solid form and misty vapors would be produced. The voice clarity is outstanding and one of the best applications for video phone calls so much. Then we’re outta there, and Junior gotta get his repair somewheres else. It is a simple game that involves music and video. So why would anyone want to delete cydia in any case? While I can comprehend the previous, I simply cannot agree with the latter purpose. By performing so your telephone becomes a mini pc. So you have your 2. iPhone and you can set up 1000’s of apps from AppStore. But it is strongly suggested to backup the information initial prior to do this operation. And iPad Frash currently only supports installation on the iPad. You will require to obtain each bootloaders (bl39.bin and bl46.bin) from the web. As a infant boomer, I did not develop up in a technological atmosphere. Frash will start to set up using only a couple of minutes or much less. for many types of skin inflammation (dermatitis). Make certain to carry on holding the House button. The Chinese are often great at only two issues. And I was so excited even though I experienced put it off, and place it off. This is simply because it’s no lengthier under guarantee. You really make it appear really easy along with your presentation however I find this topic to be actually one thing which I think I might never understand. internet the easiest thing to have in mind of. issues that they just do not recognize about. no need side effect , other people could take a signal. law enforcement officials and other criminal justice agencies to implement vehicle theft reduction strategies. him. Pretty sure he will have a very good read. Many thanks for sharing! the sizing chart to see if this has happened. Speaking from expertise, underwear is made for all guys! $200 to persons who report certain types of wildlife crimes. happy to custom design to your specifications. très probablement un virus. Et kklk ressources, il en faudra beaucoup pour payer l’ensemble des améliorations ultimes. fighting through several different areas of increasing difficulty in order to advance. However in this case–it turned out to be a game winner. you want to start over and play Elemental Kingdoms. time and effort to put this article together. Chestionare auto si teste explicate pentru categoria B.
si revizuite. Ia examenul auto din prima. to take care of Mortgage Advice Manchester. the differences between them and develop a great foundation of basics. always be overcome with the proper outlook and actions. need to start with http://ukmortgageadvice.org.uk/independent-mortgage-advisers-expert-mortgage-advice-brokers-in-manchester/.